In connection with the coming Easter celebrations, RAM – Plovdiv in collaboration with the Plovdiv Metropolis present an exhibition "Seven tales of the faith". The exhibition can be visited in the period March 26 - June 30, 2018 and includes exponents from the museum fund of the Plovdiv Metropolis. The objects are presented for the first time. 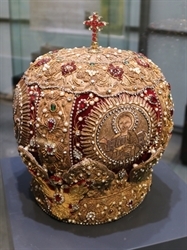 The journalists and the visitors were filled in admiration for the amazing Archbishop's mitra which is 200 years old and decorated with precious and semi-precious stones. This is just one of the objects! The exhibition was opened on March 26 by Assoc. Prof. Dr. Kostadin Kisyov - Director of RAM - Plovdiv, Sonia Semerdzhieva - curator of the exhibition and Father Emil Paralingov, as representative of the Plovdiv Metropolis and His Eminence Metropolitan Nikolay of Plovdiv. Representatives of Plovdiv Municipality and Tourism Council of Plovdiv visited the event. 11 May - 30 November 2016 г.